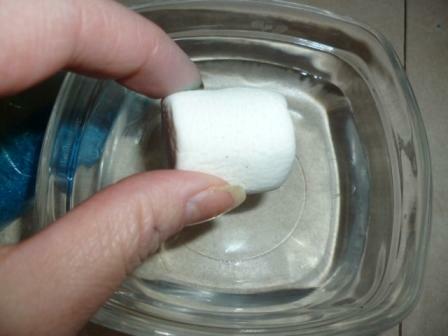 DIY Edible Nail Polish Marshmallows-So Cute and Easy! 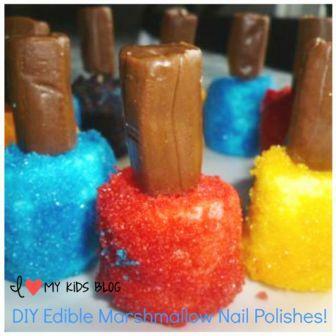 DIY Edible Nail Polish Marshmallow Treats -So Cute and Easy! About a year ago I saw these adorable nail polish marshmallow treats. I thought they were so adorable, but couldn’t find any instructions on how to make them. Don’t those look so cute?! I knew if I gave it a year some creative person would make a blog post and pin it on Pinterest with step by step directions on how to make these. 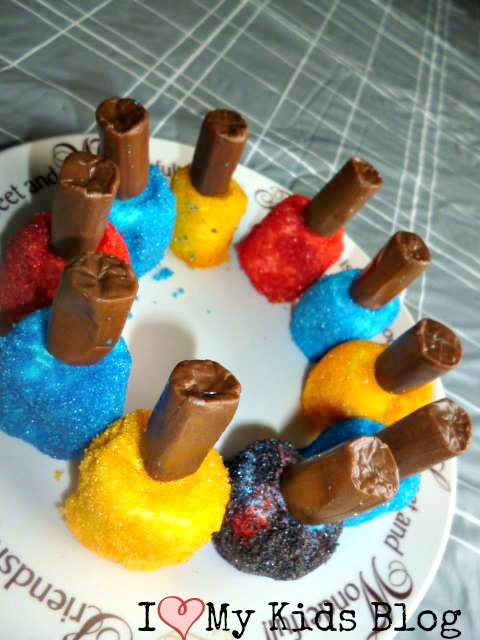 I was right, I was able to find several methods on how to make them ranging from dipping them in colored frosting to rolling in white chocolate and covering with colored sugar and more. 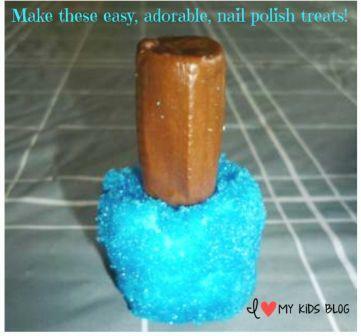 It all seemed like so much work, so I decided I needed to come up with my own MUCH easier, not so messy, kid helper friendly, way to make these edible nail polish marshmallow treats! I was so pleased with my results that today I wanted to share with you just how easy these are to make! Start by making your colored sugar. You can use the “sugar sprinkles” you buy in the cake decorating aisle, but I didn’t have any of that on hand and had plenty of sugar and food coloring. 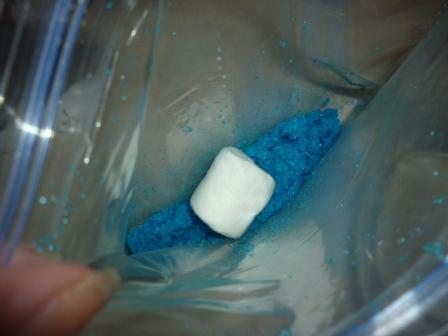 I took about 1/4 C. sugar, poured it into a zippered baggie and then put a few drops of food coloring in. 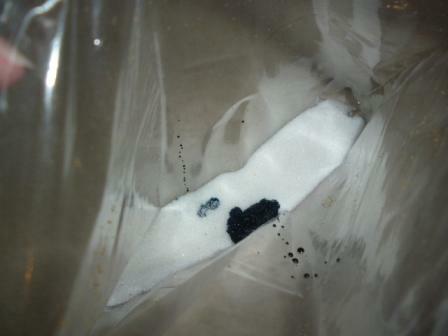 Then I zipped the baggie, rubbed, shook, and squeezed the bag until all the sugar was colored. 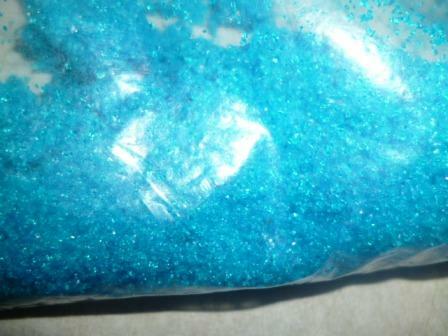 The blue sugar turned out a vibrant beautiful color! I only did 1/4 cup of blue because I wasn’t making very many nail polishes and I wanted a few different colors. You can use as much sugar and coloring as you’d like! 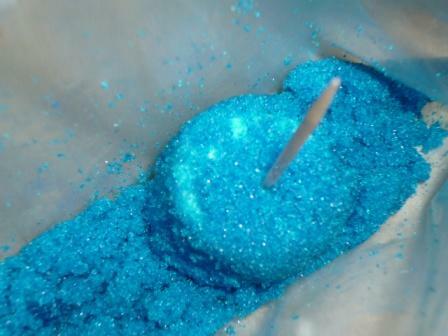 Toss into your colored sugar bag and shake until it is evenly coated. To remove the covered marshmallow simply stick a long toothpick in and pull it out. Place on a plate or wax paper–somewhere to allow them to dry a bit. 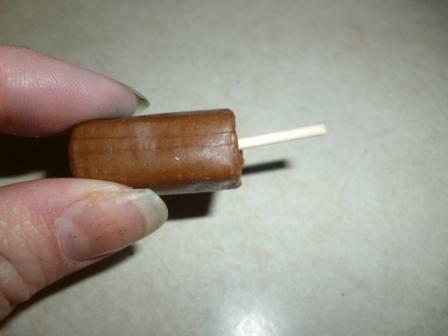 Unwrap your tootsie roll, cut a toothpick in half and slip the pointed edge into the tootsie roll. If your tootsie rolls are a little on the hard side, put them in the microwave for 5 seconds or so until they are soft. Then using the “tootsie rolled toothpick” hold the marshmallow down on the plate while removing the regular sized toothpick. 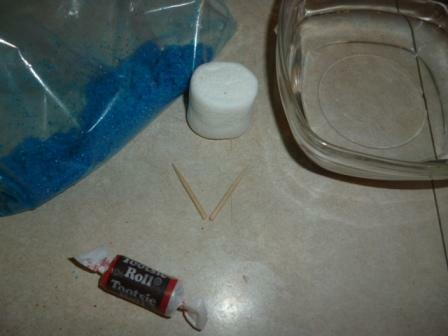 Put your toothpick to the side and use it for the next marshmallow “removal” from the sugar bag. That is it! Just repeat as many times as you desire! I had only a small bag of tootsie rolls and of course every helper needed at least 1 during the process…next time I am going to buy the big bag. These are adorable and so easy to make! The kids had a blast making them! They got to help roll the mallows, shake the bag of sugar, stick in toothpicks and unwrap the tootsie rolls. We did blue, red and yellow. Then we had one tootsie roll left and my daughter wanted to combine the left over sugars to make a multi-colored one. We put these on top of my daughter’s birthday cupcakes. They turned out so cute, but guess who didn’t get a photo—yep, this Mom. Sigh. We made these the night before and covered them with plastic wrap. I THINK it would have been fine except someone wanted to see if they were “dry” and didn’t recover them. No one claimed doing it but my 7 year old suggested that maybe the person that did it just wanted to see if they were still wet……mmmmm hmmmmm. They were a bit hard 24 hours later when we put them on top of the cupcakes. When I make these again I will make them the day of and make sure they are covered well. I hope you enjoy thee fun nail polish marshmallow treats! If you make some I want to see! Post a picture to our Facebook Fan Page! My 9yo daughter absolutely loves nail polish. I am going to make these and give them to her…sit back and laugh when she realizes that she can eat it and will not be painting those toes. Oh my gosh these are just too cute, love them! They look so easy to make too. Wow, never thought about making something like this – so creative! These are interesting. I would make them in a heartbeat since I love nail polish. I would definitely make greens, pinks, blues and purples. Yes, you’re right- those would be pretty! This is so different, I’s not sure if I will try it. 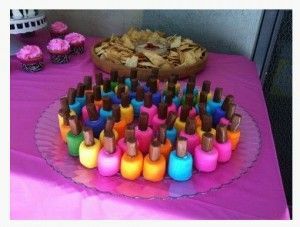 This is such a cute idea and A nail polish marshmallow treats. I want to make them for a birthday party that is coming up. They are too cute! Those are adorable!Why didn’t I think of that? Was planning on doing a spa night for my tween and some of her friends. These are a perfect treat to serve. So cute! 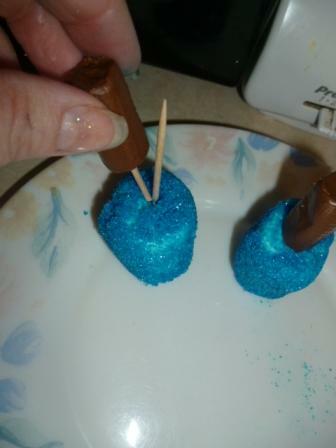 I made these very similarly but I used a small amount of melted chocolate to secure the tootsie roll so my little ones didn’t have to bite around a tooth pick. hi, do the colored sugar on the marshmallows dry well or remain sticky? i am on a tropical island and a bit scared in case they dont dry. Again…sorry to ask millions of questions..:) I will try these marshmallows soon with the sugar only. I order the tootsie rolls online because they dont sell it here..and i havent found anything similar that can match them. Are the tootsie rolls nice to the taste? i was recommended to try liquorice twists (the thicker ones) but i know 6 yr old kids will not like them. Also.. what food coloring did u use? gel or water-based?..did it tint ur hands?.. How did it go? It did tint my hands A bit!